i have designed a voltage reference with 1.3ppm/C over the temperature from -50 to 125. the voltage reference at typical condition is about 1.183V. could anyone tell me how to determine the exact resolution bit for ADC that compatible with the voltage reference. 1.183 is four significant figures in decimal. You need to be able to count at least that high in binary. We look for the next lower power of 2. This is 1024 = 2^10. Then if we fill all bit positions with 1's we can count to 2047. Your resolution needs to be 10 bits minimum. This results in a range of 2.047 V decimal. If you need greater range then you must add another bit of resolution. Each additional bit doubles your range. ... voltage reference with 1.3ppm/C over the temperature from -50 to 125. the voltage reference at typical condition is about 1.183V. A constant (straight) TC of 1.3ppm/C over a 175K temp. range would change your voltage ref. ≈ 0.27 mV. As the temp. dependence probably is parabolic, you might expect a volt.ref. change of about ± 1/4 of this value, or ± 67µV ; you don't want this to change your LSB, hence this value should be less than 1LSB, say ½ LSB. At a full scale of (e.g) 2.5V , a 15bit ADC's LSB would be 76µV , so you could theoretically reach a 14 to 15 bit resolution with such a good voltage reference. No argument with using more bits. I did think of going up to the next higher power of 2, then subtract one. The next higher power of 2 is 2048 (2 ^11). That makes 12 bits. Which turns out to be 11 bits filled with ones. I should have said 11 bits. Then we have 2^10 + 2^9 + ... + 2^1 + 2^0. I forgot to count the 0 bit. I was incorrect to say 10 bits is sufficient. 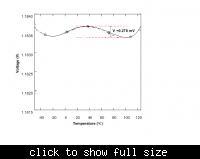 i have attached the simulation result of the voltage reference. Erikl, i still dont understand how did you estimate +-1/4 changes from 0.27mV variation. could you please explain me base on the attached simulation result? Erikl, i still dont understand how did you estimate +-1/4 changes from 0.27mV variation. could you please explain me base on the attached simulation result? This was just thought as a calculation example. As I couldn't know if your TC=1.3ppm/C was a mean, typ. or max. value, I just took ±¼ of your stated TC multiplied with the given temperature range for the calc. example. Please, could someone complete the bellow discussion? 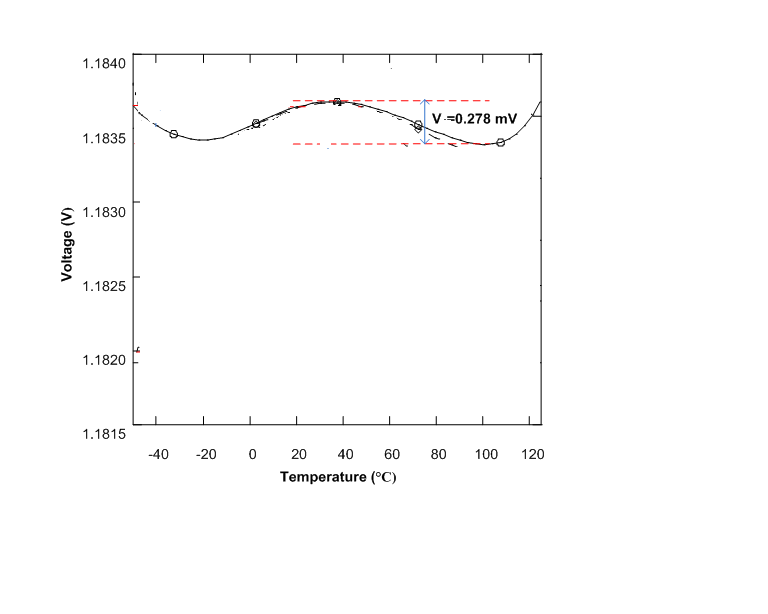 1)Why should the variation of voltage reference over the temperature range be less than VLS, or VLS/2? I could think that the whole circuit of the data converter (amplifier, comparator, etc…) suffers variation over the temperature, what consequently results in compensation between the effects. Why am I wrong? 2)I don’t understand why there is this concern in guaranteeing an accuracy of 100 uV over the temperature range, if after the fabrication process, the voltage reference will vary much more due to the variability of the process. For instance, more than 20 mV. In order to achieve less than 500 uV of accuracy, it would need a trimming circuit with many bits (for example fifteen bits to ensure 500uV). 3)Could I state that all voltage reference circuits for ADCs with ENOB around 14 or 15 bits uses bits of trimming?